The ICOM IC-7300 160m – 4m Software Defined Radio (SDR) transceiver. Hi and welcome to this review for ICQPodcast of the hot item all have been talking about for the last couple of months. The new software defined HF radio from ICOM, the IC-7300. This audio review cannot show you the rig and all of its features however there are many videos and technical documents on the Internet that can. Simply search in your favourite search engine for IC-7300. My review is about how and why I chose to buy this rig and what my initial thoughts about it are. I bought this rig myself, it was not supplied to me by ICOM or an ICOM dealer to review. As is the case with all equipment described on ICQPodcast we buy the equipment outright and reserve the right to give our honest opinion of the equipment, without having to consider how a dealer might feel about a review. About five years ago, I returned to the Amateur Radio hobby, having been away from it for over 35 years. I was based in Australia and came back to find my Class B UK licence, RAE exam pass certificate qualified me for a full licence as no Morse test was needed any longer. This meant that I was able to consider operating on the HF bands as well as the VHF bands. After looking around at rigs, I decided to buy an 18 month old Kenwood TS-2000 “shack in a box” from an Australian dealer. I had also considered the Yaesu FT857D but decided on the larger, easier to read TS-2000 layout. When operating in the UK many years earlier I had bought three ICOM rigs as they were good value at the time compared to other makes. When I looked at ICOM five years ago, I saw what were, in my opinion, rigs that were too expensive compared to Yaesu or Kenwood. Five years have passed and I am now back in Europe and finding that I operate nearly all the time on the HF bands and that the over 15 year old design of the TS-2000’s receiver is nowhere near as sensitive as more modern rigs, especially when trying to receive QRP stations on bands full of QRO stations. I had used a friends SDR rig while in Australia and the receiver performance had impressed me, however how good an SDR radio was depended upon how good the PC it was attached to was. Specifically how good a sound card the PC had attached to it was. There were many interconnecting cables to multiple boxes to produce even just 10w of output. The idea of a rig that on it’s own would not work did not appeal to me. So even the very good but rather expensive Flex range of rigs would not fit my criteria. I found the Elecraft K3 also to be expensive and it doesn’t take advantage of many SDR features. I then heard about a new SDR rig coming out from ICOM, that operated without needing to be connected to a PC and my first thought was that it would be too expensive to consider as replacement for the Kenwood TS-2000. I heard that the US price was going to be around $1500 and my interest peaked however I waited first to see what the price in Europe was going to be. It’s not unusual to find new rigs being sold in Europe at 50% or more above the US price. Then the prices came out and the UK price was the same as the US price with the price in Germany only a little more expensive. Before placing an order, I went through all the specifications that were now appearing on-line and found that there were three main versions of the IC-7300 – one for Japan, one for the US and one for Europe, with some extra changes to meet some regulations in Spain and Italy. Further investigation showed that the European version would come with coverage of the 70MHz (4 metre) band, which the UK and several other European countries have and Germany has had for two test periods so far. Apart from the ICOM IC-7100, no other current rig from the major manufacturers covers 4 metres and its a band I am interesting in trying out. What I also found out was that the European model does not have the 60 metre (5MHz) band that the US model has (the US model doesn’t have 4 metres). I found this situation strange and wondered what would amateurs do in the UK where both bands are in use. So I contacted Martin Lynch & Sons and asked them this question and got an interesting answer. ICOM UK, who supply the UK dealers were re-enabling the 60 metre band in the European version of the IC-7300 for the UK market, so the UK version of the rig would have one more band than either the continental Europe or the US version. This news combined with the fact that the German dealers could not give me a delivery date for the rig, made up my mind and I placed an order with ML&S. Then started the wait – with an unusually high demand, ICOM were having difficulty in supplying enough IC-7300 rigs to meet the demand. I was told that the target would be the 10th or 11th of May for my rig to arrive with ML&S who would then courier it to me. Compliments to the guys at ML&S, they shipped my rig as predicted on the 11th and it arrived with me on Friday the 13th. of May (not an omen I hoped), just before the Whitsun long weekend. So, what about the rig itself? As I said earlier I can only tell you which features I like – for full reviews or all features, I suggest you search YouTube where there are some very detailed videos on the IC-7300. The rig is FAR smaller than I expected. Even though I had the dimensions, how small the rig actually is amazed me when I unpacked it. I’m not saying it’s to small, the knobs are adequately sized and many controls are executed via the touch screen in any case. I am thinking of the IC-7300 as base station, but it could also be used in a mobile installation without any size issues I think. The unit is a mixture of conventional controls and that 4.3 inch LCD screen, that can present a spectrum scope and waterfall as well as an audio scope along with displaying the current frequency and which options are currently turned on. ICOM have included a RTTY decoder that can display to the screen in place of the scope displays unfortunately you cannot simply plug in a keyboard to make the unit a RTTY terminal. You can however store standard replies in the RTTY memories and select those to be transmitted in response to an incoming call. As the screen is quite “busy” with the RTTY decoding and tuning functions on the screen, ICOM supply a circuit diagram for you to make your own external keypad to send one of 4 memories. I have built one of these units and have included some pictures you can see in the show notes for this podcast at icqpodcast.com. That same external keypad can be used for sending pre-recorded voice or CW messages as well. The combination of a waterfall display and the touch screen, make it possible to look at what is active on a band and where there is a peak, simply touch it and the rig will tune there. You can also tune there using the normal tuning knob. The important difference with the SDR type of radio when compared with a conventional radio is that the SDR listens to all signals across a band of frequencies, all at the same time, where a conventional receiver only receives on one specific frequency that it is tuned to. Being able to view a complete band, allows you to see where activity is in a quiet band and also the contrary, shows where a clear frequency is in a full band. The inclusion of an SD Card slot in the front of the rig (you supply the SD Card up to 32 GB in size) brings several features, the most obvious one is that you can record the incoming transmission that you are listening to. You can also use the SD card to hold a screen short of what you can see on the spectrum or audio scopes. Those voice keyer messages for SSB, RTTY or CW are also stored on the SD Card, so it’ worth getting a fairly large card. I bought a 16GB one, which seems to be more than adequate so far. An advanced feature of the IC-7300 is the ability to display the SWR across a band as a bar graph. This is similar to what we would normally use an antenna analyser for, to see where our antenna is resonant but now this is built into the rig as another use of the SDRs capability to see a complete band not just one frequency. As with most current rigs the IC-7300 has a built in auto-ATU which can operate with antennas returning an SWR up to 3:1. If your antenna has an SWR greater than 3:1 and external ATU is recommended all though the IC-7300 can be set in an emergency mode where the power output is restricted but it will then operate into an SWR ratio greater than 3:1. So far I have been very positive about this new rig, however some issues have been reported by other owners who have very strong local signals, either from nearby amateurs or from multi kilowatt broadcast stations overloading and desensitising the receiver front end. I am lucky and do not have any strong local RF signals but I can see how this might be a problem if the IC-7300 is to be used at a field day contest or on a DXPedition. Similarly priced conventional radios from other manufacturers do not have this problem, so hopefully ICOM can look into resolving this issue soon. Those audio clips were made with the internal audio recording function of the IC-7300 and transferred to my PC by simply transferring the SD-Card. My comparisons are made against my Kenwood TS-2000. Is the receiver in the IC-7300 better than the one in the TS-2000? Most definitely yes. From the moment I turned the rig on, signals were clearer and easier to listen to on the IC-7300. 15 years of receiver design improvements over the TS-2000 design are obvious. Is the transmit side of the IC-7300 better than the TS-2000 probably not. Using standard supplied microphones the Kenwood provides both a better quality audio as well as a more effective audio in noisy conditions. As I do not operate the TS-2000 just with the standard microphone but rather with a Leson dynamic microphone and a DF4ZS RF-Clipper RF speech processor, once this is moved over to the IC-7300, I expect to get the punchy audio advantage through the IC-7300 as well. The TS-2000 has several features that the ICOM does not, such as a second independent receiver, a separate HF receive antenna input and four antenna connectors compared to only one. While the TS-2000 has VHF & UHF it can also operate as a cross-band repeater and be remote controlled from a Kenwood handy-talkie. Comparing only the HF side, the TS-2000 still has the separate receiver and three antenna connectors for HF (one receive only), so the ICOM is at a disadvantage here as it does cover HF & VHF (in the form of 6 and 4 metres) and I know of no multi-band antenna that covers that range. The ICOM will need to have some form of external antenna switching and I am looking at building a diplexer which will automatically route HF RF to my HF antenna and VHF RF to my combined 6m & 4m antenna. Others may prefer to put a manual antenna switch on the output of the IC-7300. To be fair ICOM are selling the 7300 as an entry-level radio, so it is not surprising that it is missing some of these features but purely on a price basis, if you need a second HF receiver and more antenna sockets something like the Kenwood TS-590SG or the Yaesu FTDX1200 might suit your needs better. I find the “Penny pinching” practised by ICOM in not including the case handle or mounting kit in with the base rig as they used to, to be insulting, in fact given the quality of the supplied microphone, I’d have preferred they had excluded that and included the handle and mounting kit, rather than expecting the customer to buy these in addition and then not to have any in stock at the dealers! Despite these small complaints, ICOM have produced a “game changer” in the IC-7300 and I look forward to see how Yaesu and Kenwood re-act. Perhaps they will also release SDR radios but for now I have my IC-7300 and am very happy with it. Please refer to ICQPodcast.com show notes for my script of this section and additional information about how to select the non-standard bands, how to connect the IC-7300 to your PC to control it, and to operate digital modes through it and to control non-ICOM amplifiers. I hope to talk to some of you on-air with the IC-7300 in the not too distant future. 73 ’til next time – this is Ed DD5LP. The following is extra information not included in the podcast audio file about how to find the “extra bands” and also how to connect the IC-7300 to your (windows) PC. ICOM produce a product RS-BA1 that has both a server and a client component. In the larger models IC-7700, IC-7851 etc. the server component is built into the rig itself in the latest firmware but on the IC-7300 you need to use a PC next to the rig to run the server software for remote access over the internet. In the UK the RS-BA1 software is only supplied when you buy the remote control dial knob product, the RC-28, in a combined package. In other countries the software is available separately so that you can simply use the keyboard and mouse/touchpad on the PC to control the IC-7300. Current price for the RC-28 with the RS-BA1 software in the UK (from ML&S) is £ 269.94. Current price for the RS-BA1 software in Germany (from Mimo) is € 79,90. If you only want to control your rig from your PC in the shack you need to run a direct USB cable from the IC-7300 to your PC. 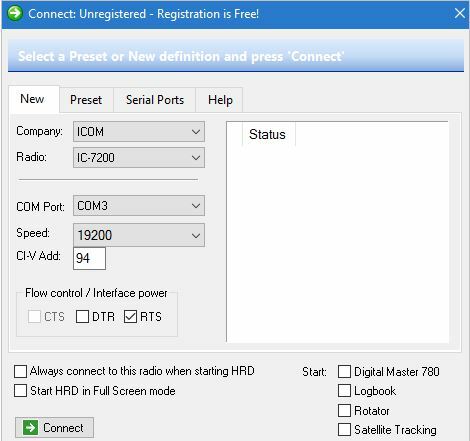 Then you can use other software than ICOMs – such as Ham Radio Deluxe (HRD) after installing the USB driver that is available from the ICOM website for free and connecting what is in fact a USB Printer cable (USB A to USB B connector lead) between your PC and the IC-7300. The free (old) version 5 of HRD does not list the IC-7300 but if you select the IC-7200 and then set the CIV address to 94 it works fine with the radio. You will not get the Waterfall, Spectrum scope or Audio scope on your PC screen, only the ICOM software can do that (so far), but all other controls appear to work fine. The HRD software has an “IP Server” capability, so that remote control (controlling the HRD software) is possible with the appropriate connection configuration and software on a remote PC. I have not tested that capability as yet. This control commands connection uses the serial port part of the USB connection. You will need to check in the device manger to see which com port has been assigned to the “Silicon Labs CP210x USB to UART bridge” under the “Ports (COM & LPT)” section, and then enter it on this screen (in my case it was COM3). What should also have been installed when you plugged the cable in between the IC-7300 and the PC is the audio-link. Look under the “Sound Video & Game Controllers” section to check there is an entry entitled “USB Audio CODEC”. This CODEC is the audio input and output from the IC-7300 that you can use with digital mode programs on your PC such as Digital Master 780 for RTTY or PSK etc. (DM780 comes within the HRD package), MMSSTV slow scan TV transmission and reception or FreeDV for HF digital voice transmissions, to name just a few. These two devices remain visible even when you turn off the IC-7300 via its power switch (as long as there is still 12v on the rig), the reason being is that you can turn on the 7300 from the PC via the remote control. What this all means, as is the case in most modern rigs, is that you DONT NEED any special interface boxes and cables between your rig and your PC any more. By having an audio “card” and serial port built into the transceiver all that is needed is a common USB printer cable to connect the transceiver to the PC. These are things that I have found out with my IC-7300 with my antenna system and local noise etc. There are several controls in the IC-7300 to help you pull out that weak SSB signal – of course we all have different hearing and as such some of the options that work for me, may not work for you – but it’s always worth a try! Turn the Noise Blanker and Noise reduction controls on if you have a high noise floor – these work very well without taking too much of the required signal away. Adjust the RF Gain DOWN to the point where the band scope is not all blue, so that you are seeing vertical lines on a black background. The RFG indicator will light because you have reduced the RF gain from it’s centre position – ignore this and turn up the AF gain to compensate for the reduced audio from turning the RF gain down. If the bandscope is not all blue at full RF gain, you may turn on the pre-amp (remember pre-amp 1 is for bands below 20m and Pre-amp 2 is for 20m and up). After turning the pre-amp on back the RF gain off to get to the border where the full blue display goes away. Now we can reduce the bandwidth to better hear the signal and reduce interference from stations on close by frequencies. There are three pre-set filters for each mode – the widest is 1 and the narrowest number 3. So number 3 is not just for CW as on some other rigs. You can even adjust these filter settings further. Changing their width and location using the Twin PBT controls. This often helps make a non-readable signal audible. When you change filter settings from their standard positions a dot appears next to the filter name in the display. If the problem is another station close to frequency you can use the Notch feature to block out part of the audio range. There is an Auto Notch and wide and narrow notch settings but I find the best option is to set it yourself. To do this press and hold the notch key in until the side display pops up and then use the “multi” knob to move when the blocked or “notched” out piece of the audio range is. You can have this manual control working on either a wide or narrow range of audio simply by pressing on the option on the screen in the popped up sidebar. To clear the side bar, press the multiknob in. Hopefully after playing with thes settings, you will see that the IC-7300 is a very special radio when trying to receive low signals – BUT be aware that having the pre-amp enabled at night time also increases the chance that non-amateur band stations can start causing interference – this will be obvious when the “OVF” indicator flashes on the screen. If this happens turn off the pre-amplifier. If it is still there apply the attenuator. Controlling a non-ICOM Linear amplifier.